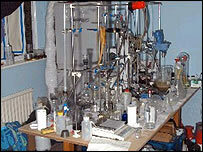 An American chemist found guilty of running a multi-million pound LSD factory has been jailed for 20 years. Casey Hardison, 33, of The Vale, Ovingdean, near Brighton, used the title of "doctor" and created a research lab, Lewes Crown Court heard. Jailing him, Judge Anthony Niblett said one of the worst features was his decision to set up the factory in the UK because US drug laws were "too hot". Hardison was convicted of producing, possessing and smuggling drugs. During the hearing, the court heard Hardison spent £38,386 on chemicals which he bought from pharmaceutical companies. He used a book of DIY drugs recipes to produce a number of hallucinogenic drugs. The court heard Hardison boasted youngsters in Britain were keen on a drug nicknamed 2CI, which it was claimed he came to the UK to produce. The court was told Hardison's father used some of the money made to buy a yacht. Officers began covertly watching Hardison after a parcel he sent to the US was found to contain four bags of ecstasy after random checks. He was arrested in Hove in February last year. Police raided his house and found a drugs factory and a fridge full of chemicals, estimated to be capable of producing drugs with a street value of £5m. Hardison claimed to have a degree in biochemistry and botany and defended himself throughout the trial. He was found guilty of three counts of producing hallucinogenic drugs, one count of possessing 145,000 wraps of LSD, one count of possession, and one of smuggling drugs to the USA. Judge Anthony Niblett said Hardison's actions were motivated by greed and said he was a "dangerous individual".